Pakoras are one of the most popular snacks in India. They are called as bajo-singular or baje-plural in Konkani. They are also called as bajji. We usually serve them along with Â meal. They are integral part of any Konkani festival/function meal. Cauliflower and capsicum baje are very popular, but people make them out of other vegetables like raw banana, potato, spinach, bread fruit, onion etc. Recently we got few requests for this recipe. I used to make them a lot when my children were small. There are many ways of making these. I am posting the recipe followed by Konkanis here. Make a batter from besan, asafoetida, chilli powder, salt. The batter should not be too thick or too thin. When the vegetable is dipped in batter, it should hold a coating of batter. Heat oil for deep frying. Dip the vegetable in the batter and deep fry. – A 1/2 tea spn ajwain can be added to the batter. It gives a nice taste. – Some people add a pinch of soda to give a thick coating to them. 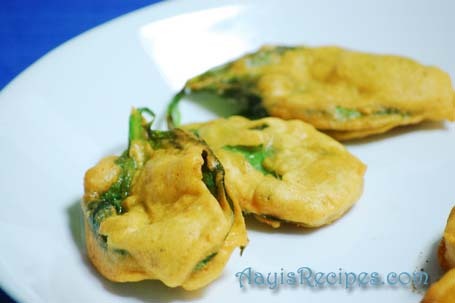 – To give crispiness to the bajjis, add 1 tea spn rice flour to the batter. – Sprinkle a little bit of chaat masala on top while serving to give a nice taste. Cabbage – Chop cabbage. Then add some onion pieces(optional) and the batter ingredients. Here the batter is not made separately, but besan, asafoetida, salt, chilli powder is added to the pieces. Mixed and small balls of the mixture is deep fried. Ginger – Chop finely. Then make them like cabbage, but make very small balls (about 1/2 tea spn of the mixture). Ginger gives a very spicy sharp taste, so do not make them too big. Drumstick, bhindi(okra), brinjal(eggplant), mushroom, paneer – These are made same as the cauliflower bajji. Onion – made like cabbage, or like the special onion bajjis. Too tempting.perfect in this cold weather with tea. Bhajjis are a must on rainy days, weddings and snacky times! thank u Aayi!! They are not looking good at all! 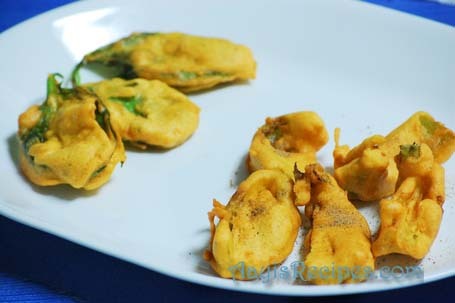 Everytime it rains, my husband has to have bajes(pakoras) and he is an expert at making them in a jiffy !!! When I tell him that we Konkani’s ahve it with our meal, he does not believe me. Well, give me bajes any time !!! Thanks varadapacchi for reminding me to make them… your bajes really look awesome and very tempting!!! My husband makes some with Vaali (Mayalu) leaves, they are simply awesome. Varada: Chetna, I haven’t seen any seeds grown to savirsambar (sasambara) plant. I had seen a program on TV a couple of days back where the chef said even though the leaves smell like ajwain, these seeds are not grown to this plant. More details about ajwain plant here. Varadpachi, they look so delicious. One more famous in Maharashtra is Kanda Bhaji, which you mentioned minus the cabbage. Chetana, Sasambara paan are Ajwain leaves. We call them as Samarpali Paan. My amma has them abundant and makes the bhajis very often. 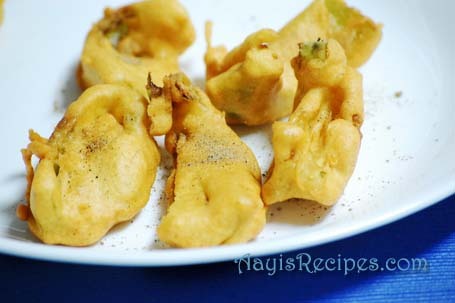 Varada: Aruna, I included kanda bajji in the post, its a favourite at my home. Thanks. Yes, we do make savirsambar bajji very often. I love pakora – in fact I made the cabbage/onion version last night! We also add jeera for baje peet.. While making Kele bajo, cauliflower bajo .. shud try with ajwain.. I never knew it was also added..Thanks a lot.. Though I have been visiting your website for some time now, this is the 1st time I am leaving my comments. What I like about your site is that the recipes are very simple and easy to make requiring easily available ingredients. Your recipe reminded me of my mother. She used to make bhajjis from different ingredients like, potatoes, brinjals, cauliflowers, onions, etc. But her speciality was the bhajjis she made from Bitter Gourd and Red Pumpkin Leaves as well as the Pumpkin Flowers, which were delicious. I made the cabbage and onion mix baje yesterday and served alongwith Kotthambari saru from AR and rice.. We both liked the saru and the baje..It was a satisfying dinner..Thanks for the new varieties of recipes..
A bite of this and a cuppa tea would be heaven in this cold weather..Looks too good..
Sasambara is also called Coleus aromaticus, Karpooravalli in Tamil and Pan-Ova in Marathi. Shilpa: Thanks Chetna. We are going to do a post on these kind of medicinal plants soon. These links will definitely help us to know more about them. Wonderfully clear and easy to follow. My American husband, who loves Konkani food, is learning to cook the cuisine and baje are one of his favorites. Thank you. Isn’t the link you are talking about, Oregano ? No, they are not same. I think locally called Sambarvalli ..something like that ! These leaves are also called ajwain leaves. ‘Taikilya baje’ or ‘Taikilya Tambli’ is one of the rarer recipes. Called ‘Takala’ in Marathi and ‘Cassia Tora’ or ‘Senna Tora’ scientific name. Does anybody know what the rainy season ‘weed’ Taikilo is called in Kannada? It grows in rainy season and esp. the tender young leaves are used. Grows in ghaan/waste-land. An interesting observation made by my mother-in-law is that where this weed grows the Parthenium/Congress grass doesn’t! !